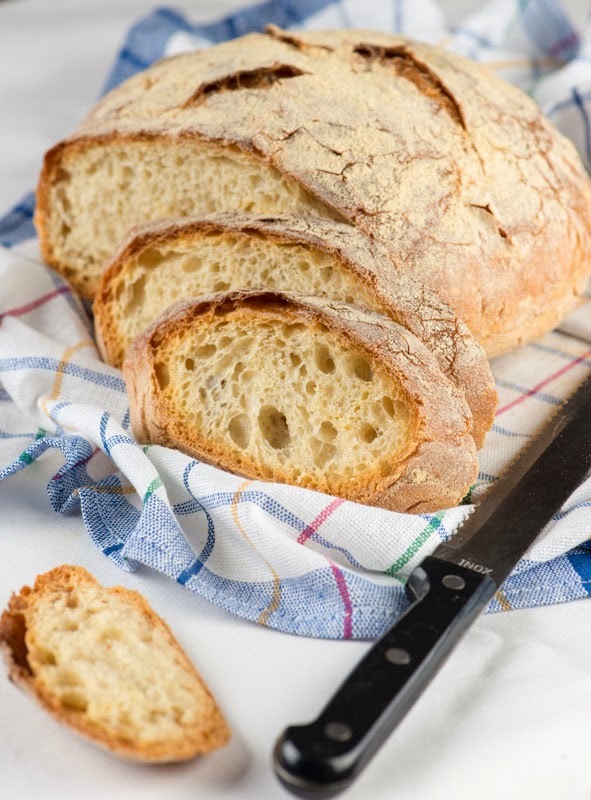 A delicious home made bread, no knead. flour meal to sprinkle on top or the board. All purpose flour can be used instead as well. Mix the yeast with the warm water in a big bowl. I used a glass one. Add the flour and the salt and mix easily until all ingredients are incorporated. Cover with plastic foil / lid and let it raise for 24 hours at room temperature. Take a wood board, sprinkle it with flour meal and put here the dough from the bowl. The dough is very sticky and soft so take it out easily using more flour if needed to not stick to your hands. Put flour also on the top of the dough and just gather the dough together without disturbing it so much. Cover it with a dip lid / reverted bowl / towel and let it raise for another 2 hours. When the dough is raised and the pot is hot, take out the pot from the oven and add a little olive oil or flour on the bottom. Put the dough in the heated pot by turning the wooden board and put the lid over the pot. Put it in the oven for 30 min, then remove the lid and let it brown the crust for another 15 minutes in the oven. Just try it and you will do it again for sure.